[Update]: New Java Version available for Windows, Mac and Linux platforms. v0.0.8-b28 (alpha) now available for testing. requires pre-installed Java Runtime Environment 1.8 or higher. Engine: Added checks to ensure users do not set the module source to either C:\, \ or User home folders - if detected PAR5E will abort the parse with an error. Engine: Removed module temp path field -- PAR5E now creates (and deletes) a subfolder called output under the root module path at the start of each parse action, the output subfolder is used to compile the final ZIP archive. where class equates to one of the classes supported by the #zl tag and object name is the name of the object to link to. An optional <title> can also be applied. 5E: Encounters: Updated encounters so that CR/XP line can be omitted from the source file. Where no CR/XP line is provided, PAR5E will now auto calculate the CR and XP of the encounter automatically. See 5E user guide for exact syntax. Backgrounds - (Re)Fixed table row parsing to support greater than 10 rows. Engine: Added OK/WARNING message suffixes to console reporting of parsed elements as an additional aid to help users with who cannot differentiate between the green/red message colouring. CoreRPG,3.5E/PF/5E libraries : updated to no longer use Module ID. When these rulesets are selected the Module ID field will be reset and disabled. 5E: pregens - updated syntax for Features, Equipment and Spell Casting to support 5E v3.0.8+. See updated documentation in 5E User guide. 5E: tables - multiple versions of tables were being output, each under its own category. Fixed. 5E: backgrounds - suggested characteristics text was being dropped from output - Fixed. 5E: docs - updated magic items with Type, Rarity / updated equipment renaming waterborne vehicles. 5E: feats - last feat was being dropped from output - Fixed. See changelog.txt in zip archive for more information. 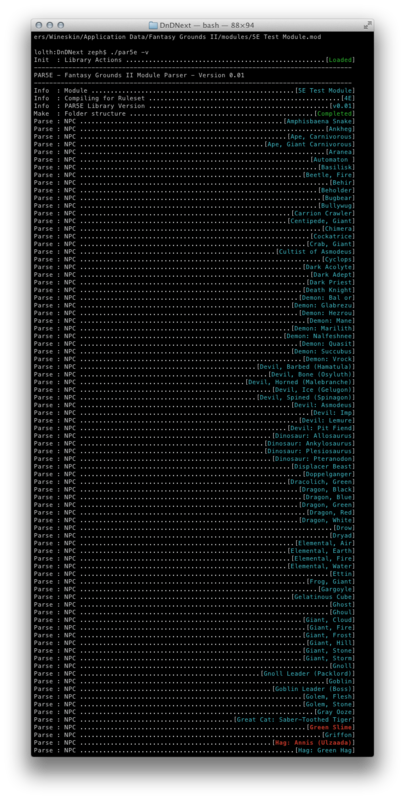 A post to say that starting with the development of a new Parser tool, I have started laying down the foundation for a new module toolchain. By toolchain I mean a suite of interoperable tools that will aid in the development and conversion of RPG adventure and rule book data into FantasyGrounds II modules. 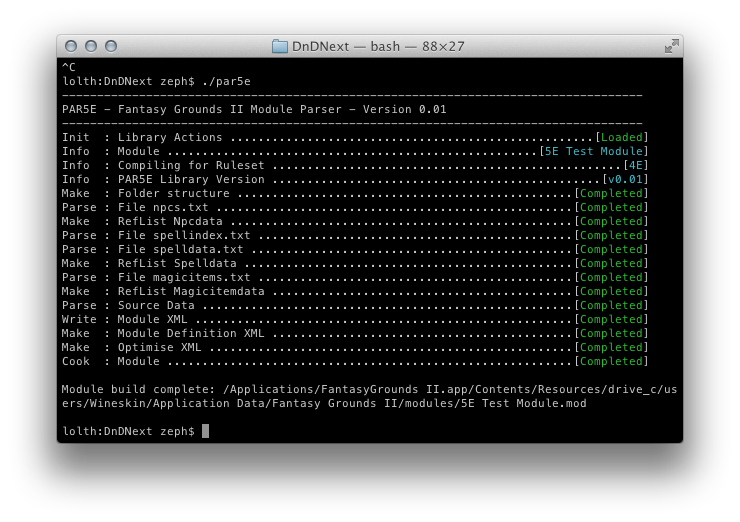 Par5e is the project name I have dubbed for the new 5E tools, starting with a new Parser. 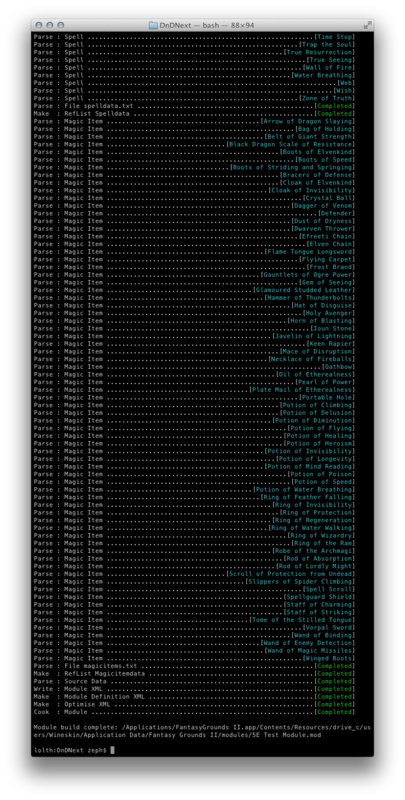 Written in Perl, the new Parser currently supports the parsing of DDN NPCs and Spells and the creation of a module ready for the new 5E ruleset, once it's written . Why Perl? Some might say. 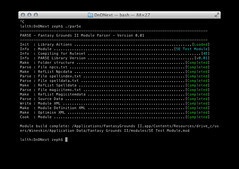 - Well for a few reasons really, i) Its a powerful and fast scripting language which is great for text/XML file manipulation, ii) Its open-source and available on all three core FGII platforms and iii) I want to release this tool as well as the Decompiler as open-source to the FGII community in the hopes that you guys can provide additional development and testing/support and provide variants of the toolchain to support other RPG systems and rulesets. I am writing this modularly so that its easier to adapt to other content; the current pre-alpha version provides a number of common base subroutines and separates the 5E specific logic, the intention being to make it simple to drop in new routines to deal with differing ruleset database structures and content. I am also currently considering moving this to Object Oriented Perl to make it even simpler to replace the logic by exploiting object inheritance and overriding (we will see). Once released the tool will support all the features supported by Tenian's excellent 4EParser including support for 3.5E/4E and 5E (future) rulesets and exporting of data directly to flat file (module) or database formats (for use with Module Workshop and if/when in the future FGII supports a restful HTTP API). The only thing the tool won't have on day one is a GUI front-end, this will be pure command line only (I believe adding a GUI would only slow down development at this stage and would not really add that much additional value). When time permits and if theres enough demand I may pen a front end in the future. Anyhow I hope to have an alpha version I can release for testing in the next two-three weeks (subject to available time really) this unless I decide to move to OOP in which case maybe a month. Given 5E will be in flux for good while yet as well as the enormity of the 3.5E/4E/5E support - I will need testers (particularly anyone who has experience of Perl) so leave a comment and I'll be sure to keep you apprised of developments. Last edited by Zeus; March 24th, 2014 at 12:20. * All fluid by nature and therefore subject to change. some of you guys are really clever buggers! Thank you. Lord knows we need it. "The small town of Swampspittle is a charming reminder of how Faerun use to be.Plague victims crawl eloquently down it's dung filled streets; greasing the way with puss from thier buboes.While at least two children a week are burnt as the devil in the handsome market square. The town boasts two taverns, one humourous dwarf and a shop that sells little things made of straw." Count me in for testing please. - I'll write my code in Pascal for ya! GM for Rusta utilizing FG2 Ultimate. Ditto. Fortran 77 kept the punch codes forever. I actually had to program on a PDP-8 (even though the 11's were available). I had a drill master for an instructor who said he'd kill us if he found an infinite loop in our *tiny* programs. Development is moving along nicely. 5E Magic Items, NPC, Spells and Equipment are all now supported with ZERO markup of the source content required. You still need to ensure your source is good quality but no need for dreaded ZZX type tagging so far. I stopped focusing on content a couple of evenings ago whilst I started re-writing the core script loop to better support additional rulesets and future planned functionality. I managed to work in some abstraction too, its now possible for other libraries to register their subroutines with the Parser. In short the main Perl script (par5e) makes use of a common Perl Module (PAR5E::Parser) to provide basic subroutine support whilst the the script hooks its main parse, generative and write XML handlers from the applied ruleset specific library (the lib for 5E is called PAR5E::dnd5Elib) via call back mechanisms, so in theory any ruleset that FGII supports can be supported by PAR5E, all that is needed is a custom library. - messaging and status updates - PAR5E will highlight status through colour coded (user configurable) messages making it easier to spot problems before you open up the module in FGII. Only joking current 5E available playtesting material takes less than 6 seconds to Parse, less than 14 to produce an entire module! Last edited by Zeus; February 3rd, 2013 at 00:26.